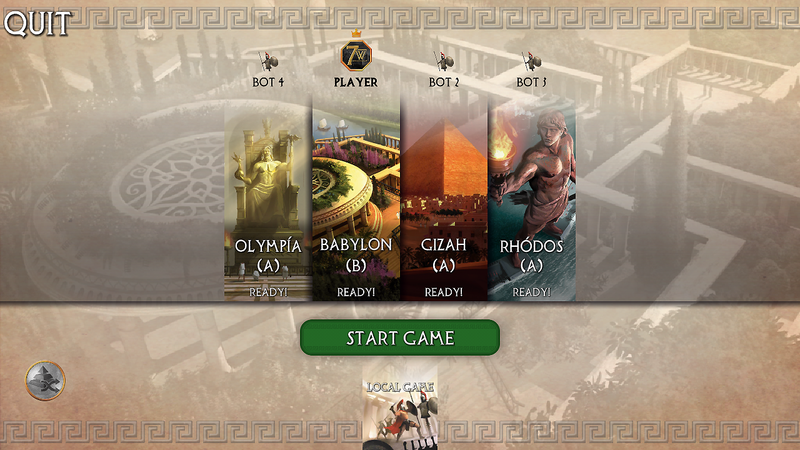 There’s an official 7 Wonders game available in the Google Play store and through Apple’s app store. The expansions aren’t there yet, nor the extra wonder pack, but there’s plenty of meat on the bone for those that want to play. 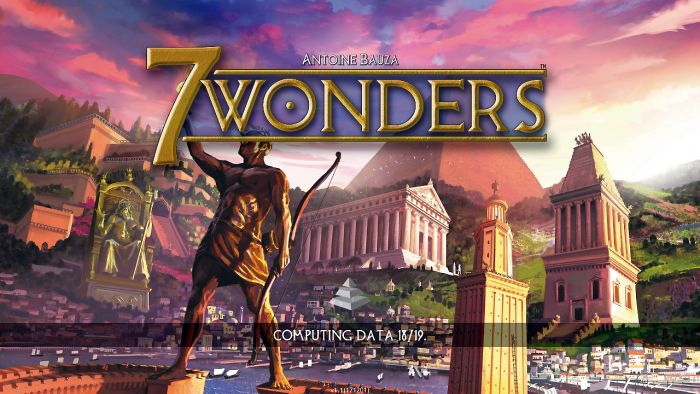 This game isn’t going to review the gameplay of the actual 7 Wonders game, but will focus on the mobile implementation of it. The UI has been smartly designed for the constrained space of a phone screen, with easy access to all of the information that would normally be visible around the table. In fact, with the pop-up score screen available, you might actually have more information available, since most of us can’t pull off those mental gymnastics in our heads. Install was smooth, and I’m running the game on a 3-year-old Droid Maxx on Android 4.4.4; I would expect performance to be a little snappier on newer apps. My biggest beef with the entire game is the length of time it takes to start up. It can take upwards of 3 minutes to fully launch, but again, I can’t definitively say if that’s the app or my older phone. 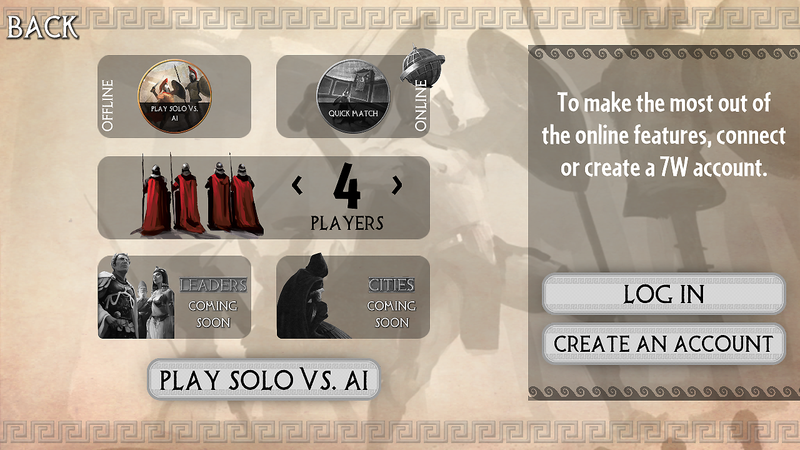 Once the game launches, you’re given the choice for the number of players, and even an online option. I’ve played 3-7 player games, and all of them move equally quick, but the interface starts to get a little cramped once you’ve got more than 5 players in the game. The game will auto-assign wonders to each player, but you can change the once you have assigned by tapping on it. This loads a screen to choose your alternate wonder. As you can see, you’ve got the original eponymous 7 Wonders in the game, but none of the initial expansion wonders like the Great Wall of China or Stonehenge or the Manneken Pis. You can play either the “A” or “B” sides of the boards by tapping on the round selector button to the right of the board you’ve selected. In this case, I’m playing Babylon on the “B” side. 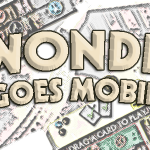 Once the game starts, your tableau shows you the progress of your wonder, along with your current cash and military points. 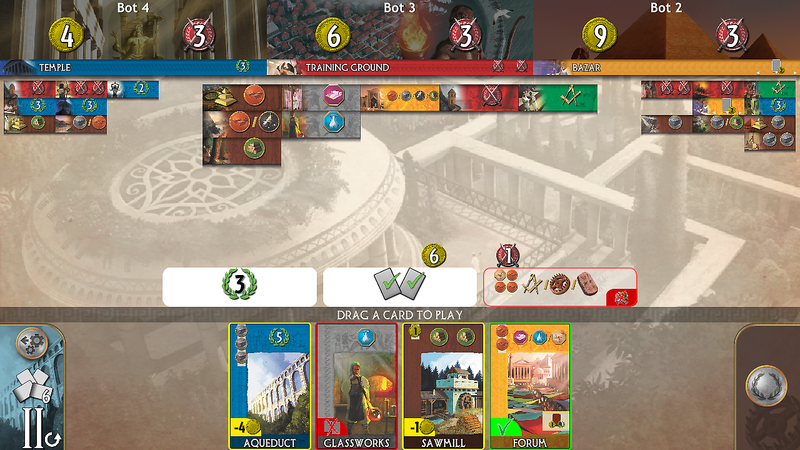 The default view for each of the neighboring players includes the cards they’ve put on the table (which are relevant to what you can build or could score based on adjacent players), as well as their cash and military points. 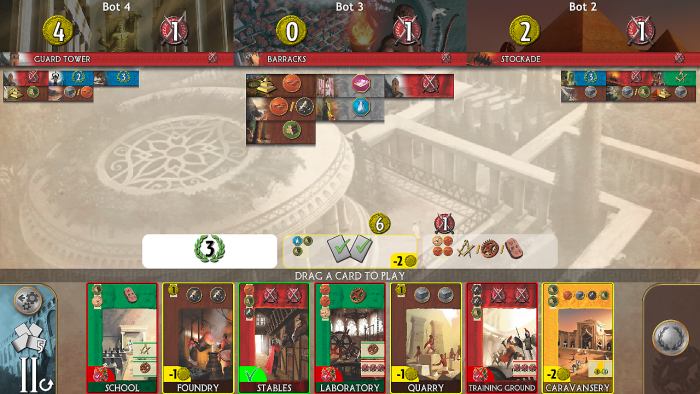 As each round of cards gets “passed” to you, they’re displayed across the bottom of the screen, along with the requirements to play each card. You get a red “x” if you can’t play it, either for lack of resources or because you’ve already got it. If there’s a coin cost, you get that displayed in yellow. Anything with a green “check” is good to go. If you pick something with a cost that could be paid to either adjacent player, you’re given the choice of where to pay it. What’s nice is that the game will even give you the option to pay more to a player, if you so choose (like trying to keep another player low on cash to prevent building something). Pressing and holding the gray ‘wreath’ button n the right side of the screen brings up a running scorecard to hover over the action. The same visual cues apply to building your wonder. When you’re able to build a stage, you’re given either the cost, or the green checkmark. If you’re unable to build, you get the red “x” seen on the third stage, above. 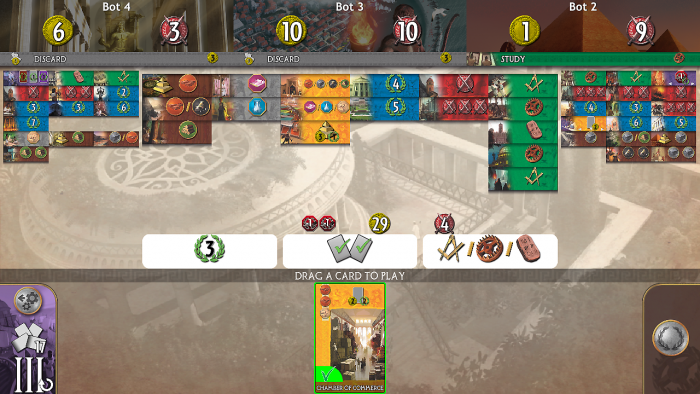 If you’re able to play a card because of a pre-requisite card being played, the green “check” will be a green “chain” instead. To build a card, you simply drag it to the target area: onto the space of the wonder to build that stage of the wonder, or onto your tableau if it’s hitting the table. If you’re discarding it for cash, a ‘target’ area for this action appears on the left side of the screen once you pick up at card. And when my hand refreshes, you can see that the third stage of my wonder is now green, and good to go. 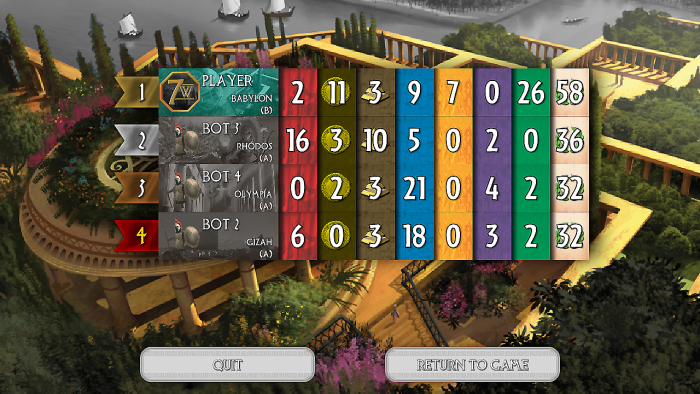 If you want to see the breakdown of your neighbors’ progress on their wonders, or the specific breakdown of the military results (like how many “-1″s they’ve accumulated for your Strategists’ Guild in the third age), you simply tap on the wonder image underneath their names (Bot 4, Bot 2) and the view will rotate between different displays. The visual depiction of military conflict between each age is the same level of abstractness you’d expect from these rules. 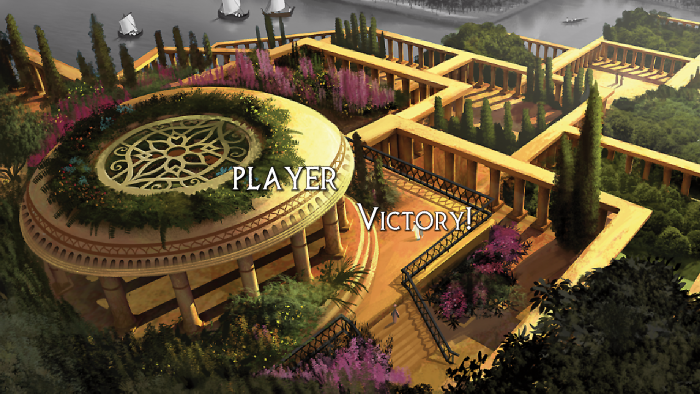 You’re given a basic animation of the victory or defeat results, and the game moves on. Honestly, the animation moves a little slow here, and could speed itself up some. Because I have the second stage of the Hanging Gardens built, I get to play, rather than discard, the last card of each age. 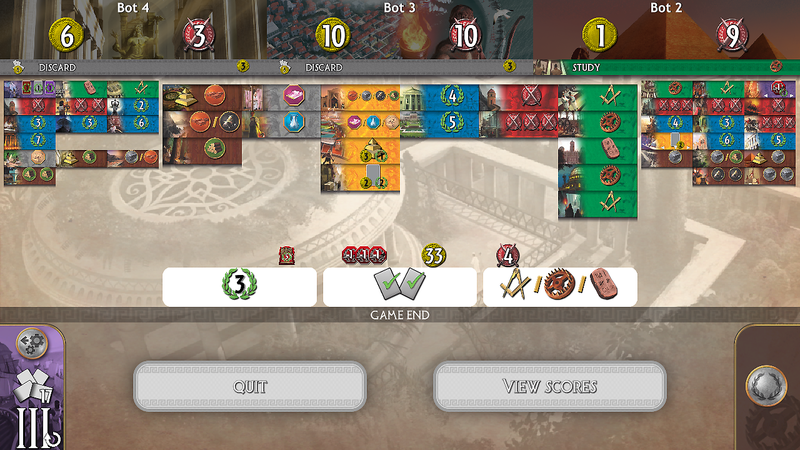 Here, at the end of the third age, I’ve got one more card to play, and because cost is irrelevant, I’ve got a green check to play it. Players have the ability to “Return To Game” to see what was on the table at the end. 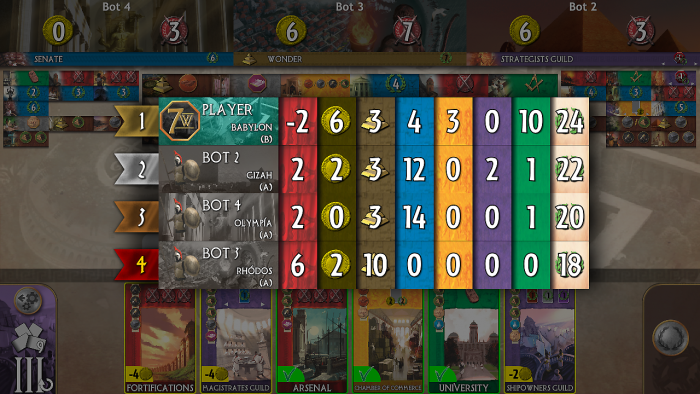 Here you can see all of the cards I was able to put into play, along with everything my neighbors played. This is useful when one of your neighbors sneaks out a military card on the last turn and suddenly beats you during the conflict round, and you want to see what happened. I’m looking forward to trying the game on a tablet with a larger tableau area so that I can see the cards a little better. 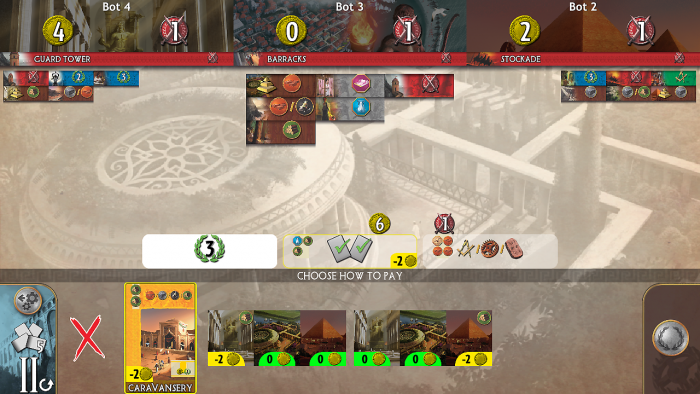 One of the things I love about 7 Wonders is that even when you don’t win, you’ve still got a pretty cool city that would make for a great RPG setting or a fun start to your Civ5 game. It would be nice to have a large enough interface to see them all. The gameplay itself is remarkable. 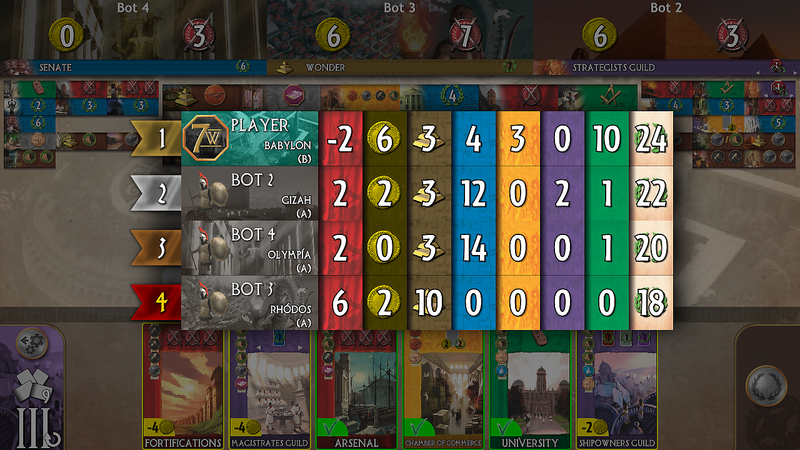 It’s amazing how fast this game can go – much like Dominion – when you’re not stopping to shuffle every 3 minutes. There are games that I’ve played that have gone faster than the startup of the game. The AIs are competitive. Winning one out of every 5-6 games as a player is a good afternoon as they are not easy to beat, even with well-know strategies. 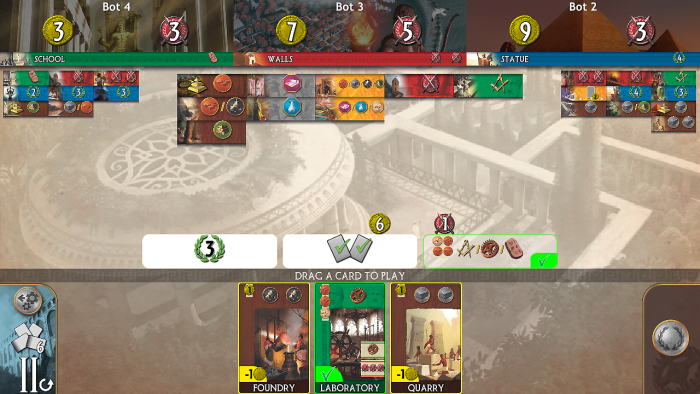 Moreover, it feels like the AI isn’t just playing it’s own game, but also paying attention to what you’re doing, so that it knows to bury a card you want as a part of the wonder construction, or making sure not to allow you access to a resource you need to finish your wonder. The visual cues are very intuitive, and language-neutral, just like the cards in the original game. To find out more information about something, the default action is to tap-and-hold for a hovering pop-up with more information. This works almost everywhere in the app and is a nice bit of continuity in the design. 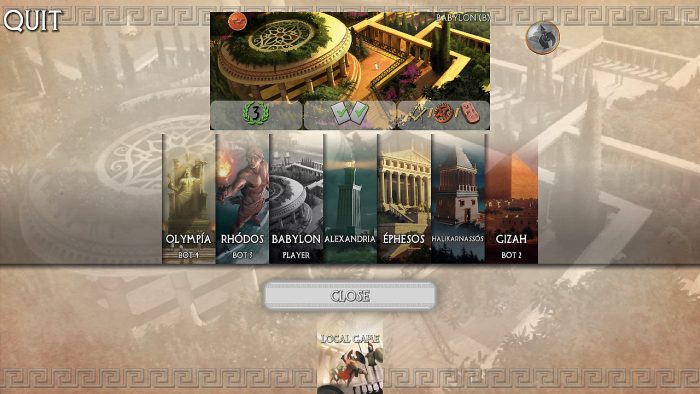 Overall, this is an excellent mobile AI-driven implementation of an all-time great game. Once the initial load speeds up (a fault shared with Splendor, and notably not with Carcassonne or Kingdom Builder) it’ll be a great on-the-go diversion for any gamer. Sorry – just leaving a reply to see if there’s a speed issue on the main page or just in the forums.